The history of Athens is the longest of any city in Europe: Athens has been continuously inhabited for at least 3,000 years. It was the birthplace of democracy and it became the leading city of Ancient Greece in the first millennium B.C.E.. Its cultural achievements during the fifth century B.C.E. are said to have laid the foundations of western civilization as revived and re-interpreted during the Renaissance and especially the Enlightenment. After a long period of decline under the rule of the Byzantine Empire and the Ottoman Empire, Athens re-emerged in the nineteenth century as the capital of the independent Greek state. Humanity remains indebted to Athenian civilization; the idea of representative, parliamentary democracy owes its origins to Athens; disciplines such as philosophy and history continue to study texts written in ancient Athens, while the values of liberal humanism were also derived from Athenian thought. The name of Athens in Ancient Greek was Athḗnai (Ἀθῆναι, IPA /ʔa.ˈtʰɛː.nai/, pronounced roughly At-heh-nigh). This is a plural form: The city was called "The Athenses" since it was originally a group of villages which coalesced into a city. The name has no definite etymology in Greek. The Greeks believed the city was named for its protectress, the goddess Athena, but it is equally possible that the goddess took her name from the city. Athens began its history as a Neolithic hill-fort on top of the Acropolis ("high city"), some time in the third millennium B.C.E.. The Acropolis is a natural defensive position which commands the surrounding plains. This settlement was about 8 km inland from the Saronic Gulf, in the center of the Cephisian Plain, a fertile dale surrounded by hills. To the east lies Mount Hymettus, to the north Mount Pentelicus, and to the west Mount Aegaleus. The River Cephisus flowed in ancient times through the plain to the gulf, passing slightly to the west of the Acropolis. A ridge runs down the center of the plain, of which Mount Lycabettus, outside the city to the east, is the highest point. Ancient Athens occupied a very small area compared to the sprawling metropolis of modern Athens. The walled ancient city encompassed an area measuring about 2 km from east to west and slightly less than that from north to south, although at its peak, the city had suburbs extending well beyond these walls. The Acropolis was just south of the center of this walled area. The Agora, the commercial and social centre of the city, was about 400 m north of the Acropolis, in what is now the Monastiraki district. The hill of the Pnyx, where the Athenian Assembly met, lay at the western end of the city. The most important religious site in Athens was the Temple of Athena the Virgin, known today as the Parthenon, which stood atop the Acropolis, where its evocative ruins still stand. Two other major religious sites, the Temple of Hephaestus (which is still largely intact) and the Temple of Olympian Zeus or Olympeion (once the largest temple in Greece but now mostly in ruins) also lay within the city walls. At its peak, in the fifth and fourth centuries B.C.E., Athens and its suburbs probably had approximately 300,000 inhabitants. Of these, a large number were slaves or foreign residents (known as metoikoi or metics), who had no political rights, and paid for the right to reside in Athens. Perhaps only 10 or 20 percent of the population were adult male citizens, eligible to meet and vote in the Assembly and be elected to office. After the conquests of Alexander the Great in the fourth century B.C.E., the city began to lose its population as Greeks migrated to the newly-conquered Hellenistic empire in the east. 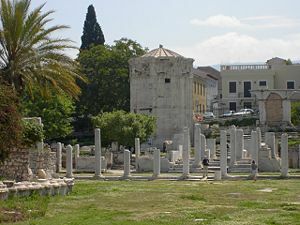 The ruins of the Agora, the commercial centre of ancient Athens. The Acropolis of Athens was inhabited from Neolithic times. By 1400 B.C.E., Athens had become a powerful center of the Mycenaean civilization. Unlike other Mycenaean centers, such as Mycenae and Pylos, Athens was not sacked and abandoned at the time of the Doric invasion of about 1200 B.C.E., and the Athenians always maintained that they were "pure" Ionians with no Doric element. However, Athens lost most of its power and probably dwindled to a small hill fortress once again. By the eighth century B.C.E., Athens had re-emerged, by virtue of its central location in the Greek world, its secure stronghold on the Acropolis and its access to the sea, which gave it a natural advantage over potential rivals such as Thebes and Sparta. From early in the first millennium B.C.E., Athens was a sovereign city-state, ruled at first by kings (see Kings of Athens). The kings stood at the head of a land-owning aristocracy known as the Eupatridae (the "well-born"), whose instrument of government was a Council which met on the Hill of Ares, called the Areopagus. This body appointed the chief city officials, the archons and the polemarch (commander-in-chief). During this period, Athens succeeded in bringing the other towns of Attica under its rule. This process of synoikia—bringing together in one home—created the largest and wealthiest state on the Greek mainland, but it also created a larger class of people excluded from political life by the nobility. By the seventh century B.C.E., social unrest had become widespread, and the Areopagus appointed Draco to draft a strict new law code (hence "draconian"). When this failed, they appointed Solon, with a mandate to create a new constitution (594 B.C.E.). The reforms of Solon dealt with both economic and political issues. The economic power of the Eupatridae was reduced by abolishing slavery as a punishment for debt, breaking up large landed estates, and freeing up trade and commerce, which allowed the emergence of a prosperous urban trading class. Politically, Solon divided the Athenians into four classes, based on their wealth and their ability to perform military service. The poorest class, the Thetes, who were the majority of the population, received political rights for the first time, being able to vote in the Ecclesia (Assembly), but only the upper classes could hold political office. The Areopagus continued to exist but its powers were reduced. The new system laid the foundations for what eventually became Athenian democracy, but in the short term it failed to quell class conflict, and after 20 years of unrest, the popular party led by Peisistratus, a cousin of Solon, seized power (541 B.C.E.). Peisistratus is usually called a tyrant, but the Greek word tyrannos does not mean a cruel and despotic ruler, merely one who took power by force. Peisistratus was in fact a very popular ruler, who made Athens wealthy, powerful, and a center of culture, and founded the Athenian naval supremacy in the Aegean Sea and beyond. He preserved the Solonian constitution, but made sure that he and his family held all the offices of state. The ruins of the Temple of Olympian Zeus. Peisistratus died in 527 B.C.E., and was succeeded by his sons Hippias and Hipparchus. They proved much less adept rulers, and in 514 B.C.E., Hipparchus was assassinated after a private dispute over a young man (see Harmodius and Aristogeiton). This led Hippias to establish a real dictatorship, which proved very unpopular and was overthrown, with the help of an army from Sparta, in 510 B.C.E. A radical politician of aristocratic background, Cleisthenes, then took charge. He was the one who established democracy in Athens. The reforms of Cleisthenes abolished Solon's four classes and replaced them with ten "tribes," named after legendary heroes and having no class basis: They were in fact electorates. Each tribe was in turn divided into ten Demes, which became the basis of local government. The tribes each elected fifty members to the Boule or Council of State, who governed Athens on a day-to-day basis. The Assembly was open to all citizens and was both a legislature and a supreme court, except in murder cases and religious matters, which became the only remaining functions of the Areopagus. Most offices were filled by lot, though the ten strategoi (generals) were for obvious reasons elected. This system remained remarkably stable, and with a few brief interruptions, remained in place until Roman times. Prior to Athens' greatness, the city of Sparta considered itself the leader of the Greeks, or hegemon. In 500 B.C.E., Athens sent troops to aid the Ionian Greeks of Asia Minor, who were rebelling against the Persian Empire (see Ionian Revolt). This provoked two Persian invasions of Greece, both of which were defeated under the leadership of the Athenian soldier-statesmen Miltiades and Themistocles (see Persian Wars). In 490 B.C.E. the Athenians defeated the first invasion at the Battle of Marathon. In 480 B.C.E. the Persians came back, and captured and burned Athens, but the Greeks defeated them at the naval Battle of Salamis. Sparta's hegemony was passing to Athens, and it was Athens that took the war to Asia Minor. These victories enabled it to bring most of the Aegean and many other parts of Greece together in the Delian League, which was an Athenian-dominated alliance. The fifth century B.C.E. marked the zenith of Athens as a center of literature, philosophy (see Greek philosophy), and the arts (see Greek theater). Some of the greatest names of Western cultural and intellectual history lived in Athens during this period: The dramatists Aeschylus, Aristophanes, Euripides, and Sophocles, the philosophers Aristotle, Plato, and Socrates, the historians Herodotus, Thucydides, and Xenophon, the poet Simonides, and the sculptor Pheidias. The leading statesman of this period was Pericles, who used the tribute paid by the members of the Delian League to build the Parthenon and other great monuments of classical Athens. The city became, in Pericles's words, "the school of Hellas [Greece]." The National Academy in Athens, with Apollo and Athena on their columns, and Socrates and Plato seated in front. Fear of Athenian power and dynamism led to the Peloponnesian War in 431 B.C.E., which pitted Athens and her increasingly rebellious sea empire against a coalition of land-based states led by Sparta, and lasted twenty-seven years. The democracy was briefly overthrown in the summer of 411 B.C.E., due to its poor handling of the war, but quickly restored. The war ended with the complete defeat of Athens in 404 B.C.E. Since the defeat was largely blamed on democratic politicians such as Cleon and Cleophon, there was a brief reaction against democracy, aided by the Spartan army (the Thirty Tyrants). In 403 B.C.E., democracy was restored and an amnesty declared. However, Socrates was sentenced to death and executed at this time. Many consider his execution to have been an act of retaliation, due to the fact that several traitors to the Athenian democracy (Charmides, Critias, Alcibiades) were his students. During the fourth century B.C.E., Athens regained some of her power, re-establishing a modified Delian League and defeating Sparta in alliance with Thebes (369 B.C.E.). By mid-century, however, the northern kingdom of Macedon was becoming dominant in Greek affairs, despite the warnings of the last great statesman of independent Athens, Demosthenes. In 338 B.C.E., the armies of Philip II defeated the Greek cities at the Battle of Chaeronea, effectively ending Athenian independence. However finely denounced by the philipics of Demosthenes (his orations gave that word its continuing significance as a denunciation), Philip prevailed. Further, the conquests of his son, Alexander the Great, widened Greek horizons and made the traditional Greek city state obsolete. Athens remained a wealthy city with a brilliant cultural life, but ceased to be an independent power. In the second century B.C.E., after 200 years of Macedonian supremacy, Greece was absorbed into the Roman Empire (146 B.C.E.). Athens remained a center of learning and philosophy during 500 years of Roman rule, patronized by emperors such as Nero and Hadrian. But the conversion of the Empire to Christianity ended the city's role as a center of pagan learning: The Emperor Justinian closed the schools of philosophy in 529. This is generally taken to mark the end of the ancient history of Athens. During the period of the Byzantine Empire, Athens was a provincial town, and many of its works of art were looted by the emperors and taken to Constantinople. Attica was invaded successively by the Goths and the Bulgars. During the period 1204 to 1458, Athens was fought over by the Byzantines and the French and Italian knights of the Latin Empire. The French knights of the de la Roche family held the title Duke of Athens. Later, Catalan and Sicilian adventurers ruled the city for some parts of the fourteenth century. Finally, in 1458, Athens fell to the Ottoman Empire. But the city's population declined and by the seventeenth century it was a mere village. The real damage to Athens was caused in the seventeenth century, when Ottoman power was declining. The Venetians attacked Athens in 1687. A shot fired during the bombardment of the Acropolis caused a powder magazine in the Parthenon to explode, and the building was severely damaged. After capturing the Acropolis, the Venetians employed material from its ancient buildings in repairing its walls. The following year the Turks set fire to the city. Ancient monuments were destroyed to provide material for a new wall with which the Turks surrounded the city in 1778. Between 1801 and 1805, Lord Elgin, the British resident at Athens, removed reliefs from the Parthenon. In 1822, the Greek insurgents captured the city, but it fell to the Turks again in 1826. Again, the ancient monuments suffered badly. The Turks remained in possession till 1833, when they withdrew and Athens was chosen as the capital of the newly established kingdom of Greece. At that time, the city was virtually uninhabited, being merely a cluster of buildings at the foot of the Acropolis, where the fashionable Plaka district now is. 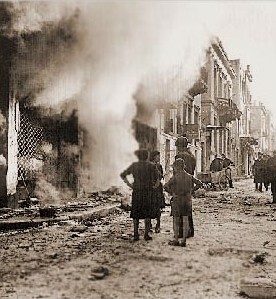 The aftermath of street fighting in Athens, December 1944. Athens was chosen as the Greek capital for historical and sentimental reasons, not because it was a functioning city. During the reign of King Othon (1832–1862) a modern city plan was laid out and public buildings erected – this is why there are virtually no buildings in Athens dated between the Roman Empire and the 19th century. 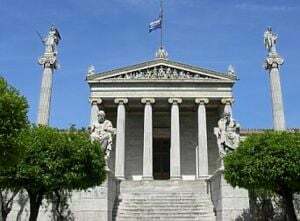 The finest legacy of this period are the buildings of the University of Athens, the Greek National Library and the Greek National Academy on Panepistimiou Street. Athens experienced its first period of explosive growth following the disastrous war with Turkey in 1921, when more than a million Greek refugees from Asia Minor were resettled in Greece. Suburbs such as Nea Ionia and Nea Smyrni began as refugee camps on the Athens outskirts. Athens was occupied by the Germans during World War II and experienced terrible privations during the later years of the war. In 1944, there was heavy fighting in the city between Communist forces and the royalists backed by the British. After World War II, the city began to grow again as people migrated from the villages and islands to find work. Greek entry into the European Union in 1981 brought a flood of new investment to the city, but also increasing social and environmental problems. Athens had some of the worst traffic congestion and air pollution in the world. This posed a new threat to the ancient monuments of Athens, as traffic vibration weakened foundations and air pollution corroded marble. 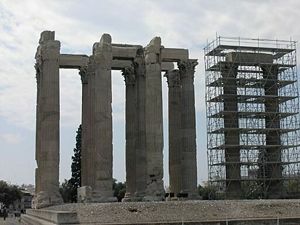 The city's environmental and infrastructure problems were the main reason Athens failed to secure the 1996 centenary Olympic Games. Democracy, widely considered to the be the ideal form of governance, owes much to Athenian democracy. Athenian democracy was based on the Assembly of all citizens but representative elements were also built into the system. For example, the Council of 500, responsible for drawing up the Assembly’s legislative agenda, was chosen by lot, while the chair for each day was also daily chosen by lot, as were those who served within the judicial and court systems. Thus, representative parliamentary government has its roots in the Athenian legacy. Of course, women and non-citizens did not take part in the Athenian system and the high value that Athenian’s placed on man’s place in the universe did not include women while Aristotle thought that some people were natural slaves, thus "humanity" was a limited concept. Nonetheless, the basic values of liberal humanism—extended and applied more comprehensively—including universal respect for human life and dignity, derive from Hellenic and in particular Athenian thought. Artists continue to be inspired by the Athenian legacy. Buildings continue to imitate Athenian architecture. If the heritage of ancient Athens were to be subtracted from the story of humanity, human life would be culturally and intellectually poorer. The artistic and intellectual legacy of Athens continues to be studied and researched within the academy. ↑ www.stoa.org, Demos: Classical Athenian Democracy. Retrieved November 7, 2007. The Athenian Origins of Direct Democracy The History Guide by Steven Kreis. This page was last modified on 23 April 2016, at 20:38.